In the last few weeks I completed my review of how you can use formations for player development. On Episode 57 I looked at 7 v 7 for U9/U10 teams. On Episode 58 I reviewed the different formations for teams playing 9 v 9 at U11 and U12. Last week on Episode 59 I looked at the transition from small-sided games to full-sided 11 v 11 matches. If you missed any of those you should check them out. Last weekend my teams finished up their league seasons. Two of my teams are attending a tournament over Memorial Day weekend but then they’ll be finished as well. The next thing on the calendar is tryouts which should be especially interesting this year with the changes to the age groups. 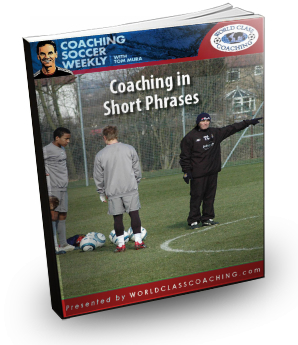 Today I want to describe how I use short phrases to connect the work we do in training to situations that the players face in games. There are times that we want to get points across to our players but they don’t have time to stop, listen and think so we need to make our point quickly but in a way that affects the players thinking and actions. I’ll describe my favorite 19 short phrases. I’ve divided them up into six different areas of the game ranging from ball control to defending. You may already be using some of these yourself without considering why they work and how you could use them more effectively. This episode will get you thinking about more ways that you can connect important coaching points to key phrases so that you can help your players learn without over coaching them. Coaching is transferring your knowledge to your players. You can’t do it for them, you have to give them the tools and teach them how to apply them correctly to the situations they’ll face in the game. Whenever we’re working on something in training I try to connect it to a short phrase that serves as a que to get the players to make the connection between the phrase and the important factors of the skill or idea that we’re working on. This type of shorthand helps me get my point across to the players without having to reteach the technique or tactic during the exercise, scrimmage or actual game. I don’t think I’ve created a new idea here. There are some of these phrases that you hear over and over like, “Far Post” but that’s telling the player what to do not how to do it. I prefer to say, “Twist Your Foot” to describe how they can position their body to shoot toward the far post. Here are the short phrases that I use with my own teams. There are many other phrases that you could use to describe these actions and ideas. There’s no magic in the phrases that I use. The key is for you to select phrases that are both short and memorable. Then you have to link those phrases to what you’re doing in training. The players need to hear them over and over again to make the connection. That way, when they hear them in a game, they can instantly remember the process from practice and apply it to the situation they are in during the game. The show notes for each episode are accessed through the WCC Training Center. They are FREE but you will need at least a Free Membership to the Training Center in order to view and print them. Click on the image of the notes and if you’re already logged in to the Training Center you’ll be taken to the Podcast page. If you’re not logged in your be taken to a login page where you’ll also be able to login or register if you are not already a Member. Make sure you subscribe to Coaching Soccer Weekly through iTunes or Google Play Music, or your podcast provider of choice, to be sure you never miss an episode. I would appreciate it if you would leave a 5 star rating and a written review on iTunes to help spread the word about the show and the information that we are sharing here. I won’t have a podcast to release next week because I’ll be traveling with a couple of my teams to a tournament in Chicago. I’ll be back June 3rd with more training sessions and coaching tips. I use it when players don’t use their fartest foot / backfoot to control a ball and it leads to miscontrolling the ball. Thanks Bjorn. That’s a good one. Thanks for sharing. Thanks Tom, great podcast. I think a lot of coaches dont get that half of their job is simply to communicate ideas properly so that players can pick them up and internalize them. What’s the saying… ‘coaches teach, but players develop’? Anyway, without explicitly saying it your list of words embodies the main principle for coaching tips for youth players – ‘dont give outcomes; give actions/directions’. For example, ‘take up a defensive position’ is an outcome you (usually the coach) want achieved. Whereas ‘get on your surfboard’ is the action the player should perform. After listening to this, in my own training I will even change from ‘shield the ball’ to ‘protect it’. I am an adult and have well developed language skills; the fact that ‘shield’ can be both a verb and a noun (abstracted in this case) is a typical english-language ambiguity that I can deal with. But my players are young kids. If I say ‘protect it’ that is a clear action and not some potentially nebulous outcome. Small, but subtle, and it will also keep my coaching tips correctly focused. Anyway, great podcast topic. Thanks for the coaching tips! Thanks! I’m glad that the episode helped you think more about your own coaching. This was an amazing episode… one of your best! I found myself going back and replaying certain parts of it. Would these points work well for younger kids U8 and below? Depends on the group I suppose. Eyes Up, Protect It and How Can You Help stand out to me as easier for the younger ages. Thanks! I think short phrases work well with players of any age. You just have to make the connection between the phrase and the technique or tactic you’re focusing on. Thanks for the link Kevin. I love hearing parallel ideas from other sports.